Preserved mustard is a type of pickled mustard stem. It is call “teem mui choy” in Chinese. 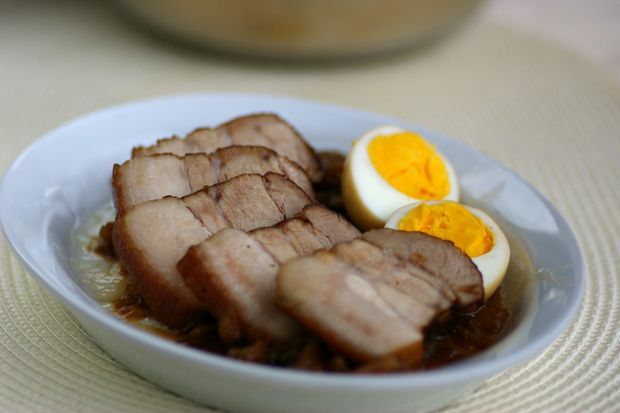 Cook pork belly in boiling water for 10 minutes. Remove and pat dry. Rub with dark soy sauce, then deep fry in hot oil, skin side down, until golden. Dish out and drain well. Heat a tablespoon of oil and sauté ginger and garlic until fragrant. Add the preserved mustard and stir-fry until aromatic. Add seasoning and pour in water. Cover and simmer for 25 to 30 minutes. Remove the mustard and its gravy to a steaming dish and place the pork on top. Cover with aluminium foil. Steam over high heat for 1 to 1 1/2 hours until meat is tender. Remove the meat and cut into thick slices. Transfer the preserved mustard to a serving plate, and top with the pork; pour the gravy remaining in the steaming dish into a pan. Add the cornflour solution to the gravy and bring to boil. Pour the thickened gravy over the pork slices and mustard, and garnish with the egg.